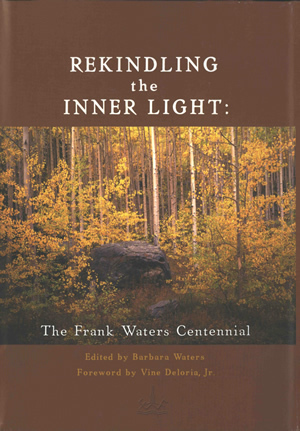 Rekindling the Inner Light: The Frank Waters Centennial, edited by Barbara Waters, contains a chapter by Tony Hillerman, "A Canadian Experience With Frank Waters: Student on One End of the Log, Teacher on the Other" beginning on page 163. This volume was published by the Frank Waters Foundation Press in 2003. This is a hardcover book with dust jacket. Cover and book design are by James M. Watson. The front cover displays a photograph of an aspen forest in the fall with a large rock at the center, below the book title, printed in white on a reddish-brown background. Below the book, the editor and forward credit are printed in orange above the Waters Foundation logo. The back cover contains two excerpts from the book, the first by Vine Deloria, Jr. and the second by Rudolfo Anaya. Thumbnail photos accompany the excerpts. The bar code is at the bottom left of the back cover. The dust jacket has fold-outs; on the front is an excerpt by John Nichols, with thumbnail photo. On the back is the photo and biography of the editor, Barbara Waters. The inside front and inside back covers are blank, and the end papers are white. Binding: Full binding, goldenrod cloth-covered boards. Waters Foundation logo embossed in gold on front cover center. Book title and foundation logo embossed on spine in gold.